Es ist davon auszugehen, dass dieser nach einer möglichen Räumung der Pizzeria wieder steigen wird. In den Plänen der Firma für die Neugestaltung des Hauses sind die derzeitigen Bewohner*innen nicht mehr enthalten, doch diese weigern sich seit Jahren ihr Zuhause zu verlassen. Nachdem mutwillige Zerstörung der Infrastruktur, Verweigerung von Instandhaltungsarbeiten, nächtliche Einschüchterungsversuche, finanzielle Angebote und sogar Anschläge mit Buttersäure, Altöl und Farbe nicht gefruchtet haben, kamen die Eigentümer auf die grandiose Idee eine Gruppe „Punks“ dazu zu benutzen die renitenten Mieter*innen zu vertreiben. Dies zu vermeiden war von Anfang an unser Ziel. Stattdessen haben wir unser Möglichstes getan, um sie gegen die Eigentümer zu unterstützen. ein widerständiges Projekt, ein Schandfleck, ein lautes Nein! Ein Haus in dem Widersprüche nicht totgeschwiegen und verdrängt werden, sondern versucht wird damit einen Umgang zu finden. Ein Freiraum in dem gemeinsam Strategien zum Überleben im kapitalistischen Wahnsinn entwickelt werden. Ein Ort des konkreten Widerstands gegen Immobilienspekulation und Gentrifizierung, in diesem Bezirk und in der ganzen Stadt. Auch wenn wir nicht immer die einfachsten Nachbar*innen sind, schränken wir doch den Handlungsspielraum der Castella GmbH massiv ein, indem wir Öffentlichkeit schaffen, Sabotageakte verhindern und aktiv gegen Einschüchterungsversuche vorgehen. Außerdem wird durch unsere Anwesenheit verhindert, dass das ganze Haus in eine Baustelle verwandelt wird wodurch die Belastung der Altmieter*innen noch weiter steigen würde. Darüber hinaus würde die geplante Sanierung und Erweiterung um drei Stockwerke mit dazu beitragen, die Mieten im Bezirk weiter hoch zu treiben. So sind wir die Geister die sie riefen und stehen seit nunmehr zwei Jahren der effektiven Kapitalverwertung durch die Castella GmbH im Weg. All das sind Gründe, warum wir alles tun werden, um im Haus zu bleiben. Alles zu unternehmen, bedeutet für uns auch die Räumung mit juristischen Mitteln zu bekämpfen. Für uns ist es wichtig, klarzustellen, dass wir diese Bemühungen nicht als Kooperation mit der Ordnung verstehen, die wir bekämpfen, sondern als Versuch, sie mit ihren eigenen Mitteln zu schlagen, und so die drohende Repression und den Verlust unseres Hauses abzuwenden. Wohnen ist ein Grundbedürfnis, welches zur Ware gemacht wird. Deswegen sehen wir unsere Entscheidung, diesen mietfreien Raum zu verteidigen, als klares Zeichen gegen das System. Miete, Behinderung alternativer Wohnmöglichkeiten und Verdrängung von bestimmten Menschen sind Teil eines Kontrollsystems, welches uns daran hindern soll, unser Leben selbst in die Hand zu nehmen. Dies trifft natürlich diejenigen, welche von diesem System als «unnütz» betrachtet werden, am härtesten. So sind in Rentner_Innen, Student_Innen, Arbeitslose, Geringverdiener_Innen, Alleinerziehende, Punks und viele weitere Menschen durch Miete und andere kapitalistische Widrigkeiten in ihrer Existenzgrundlage bedroht. Gegen diese Verhältnisse, die ihren Ursprung in der bestehenden Eigentumsordnung haben, sollten wir uns gemeinsam zur Wehr setzen. Weil es nicht ok ist, dass die Mieten steigen oder überhaupt existieren. Weil es nicht ok ist, dass es Menschen gibt die keine Wohnung haben, weil sie sich eine solche nicht leisten können.Weil es nicht ok ist, wenn Mieter_Innen von Hauseigentümer_Innen drangsaliert werden. Aber vor allem, weil wir für ein solidarisches Zusammenleben in einen selbstverwalteten Freiraum, als eine antikapitalistische Alternative, stehen wollen. Kurz gesagt weil wir zu zeigen versuchen, dass es auch anders möglich ist. Der Räumungstermin ist am 28.07.2014. Wir rufen dazu auf ab sofort gemeinsam aktiv zu werden und die Räumung zu verhindern! Uns ist wichtig, unseren Lebensraum so lange wie möglich zu schützen und nichts unversucht zu lassen. Für uns ist deshalb klar, dass wir uns in jedem Fall am 28.07. die Straße nehmen werden, um gegen Räumungen, Miete, und Gentrifizierung zu protestieren. Wir grüßen alle widerständigen Menschen, die gegen alle Formen der Herrschaft und für ein selbstorganisiertes Leben in gemeinsamer Solidarität für eine andere Gesellschaftkämpfen. Bewegt euch! Seid Laut, kommt vorbei oder denkt euch etwas aus. Besetzt Häuser, lebt wild und gefährlich! Der Ofen ist noch lange nicht ausgebrannt. 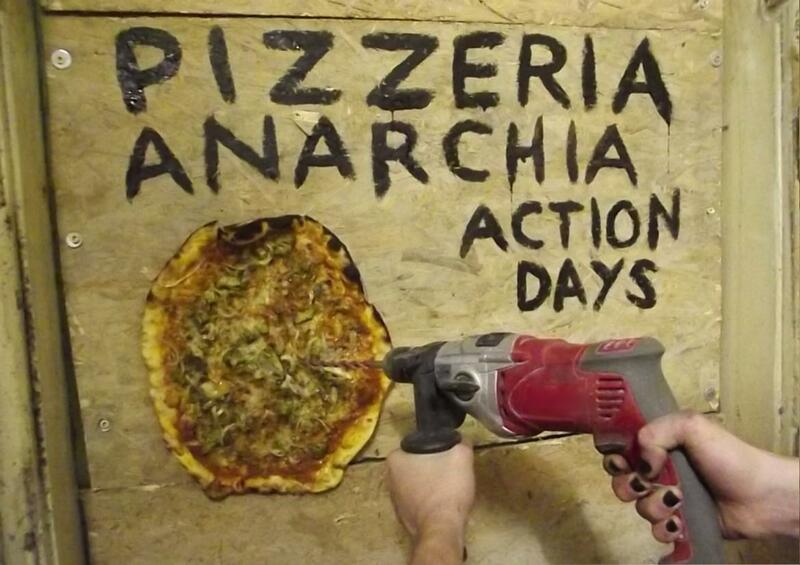 Pizzeria Anarchia is a Squat in Vienna. Our house. For over 2 years we give our hopes and dreams to the Pizzeria Anarchia. We lived here together, sharing in our troubles and love. We’ve had discussions, workshops, community kitchen, actions and resistance against the unbearable status-quo of present day mainstream society and state. For 2 years now we have lived without a contract; we are still against entering into one. This condition is of course not accepted by Austrian law, hence an attempt to evict us will be made on 28.07.2014. We will not leave, we will fight for our house, and we ask you to support us. This is not just our fight. It is also a fight for our neighbours within the house who have been living here for many years with unlimited contracts. They are not directly affected by the eviction, but the owner of the house (Castella GMBH) has been pressuring them to move out for a long time. When we are gone, the owner will be able to pressure them again, because we cannot defend them anymore. The owner-company has plans to rebuild the house, and in these plans the flats of our friends, the neighbours, don´t exist anymore. For years they have lived in these flats and called them their homes, and they don’t want to leave. Tactics which were used by Castella GMBH to try and make them leave include: vandalism of the supply systems, damaging the roof to allow rain to enter the flats, refusal to carry out maintenance work, nightly visits of intimidating individuals, financial offers and attacks with Butyric acid, used oil and paint. When these attempts to intimidate the tenants failed the owner came up with the Idea to invite a group of “Punks” into the house to wear down the patience of the resilient residents. Since we move into the house, we try not to play the game of the owner. We support the long-standing residents against the Castella GMBH. During the time we are here the Pizzeria Anarchia has always been developing more and more into a resisting project, an eyesore, a loud ‘NO!’ in the face of society. We talk about our own problems and try to combat them. We try to find ways together, to survive the daily capitalistic nightmare. Finally we build up a centre of concrete resistance against real estate speculation and gentrification, in this district and the whole city. We are not always the easiest neighbours, but we limit the ways in which the Castella GMBH can attack our neighbours by publishing their behaviour, stopping sabotage against them, and directly blocking intimidation. While we are living here the building work planned by Castella cannot be carried out. Based on the plans, there is no way this work can take place without our neighbours having to leave their homes meanwhile – maybe for a period of years. The Building work which is planed will add 3 more stories to the house – increasing rent in the whole district. Our presence here is a constant blockade to the inhumane and capitalistic daydreams of the CastellaGMBH. For us these are reasons enough to do everything in our power to protect this house and stay here. Doing everything includes the use of juristic weapons too. But it is important to say that we do not think that this is a cooperation with the legal system which we are fighting against. We only try to use the state’s own weapons against them. We fight every way we can to overcome repression, and to resist losing our home. Accommodation is a basic need which is treated as a commodity. Therefore we think the decision to fight for a place where we live without paying rent is a direct critic of the system. Rent, poverty, a lack of alternative housing options which are not treated with repression, and displacement of certain people; these things are part of a control system which stops us from living a self-determined lifestyle. This system is especially hard for people who are “inferior” in the view of the system: people who are studying the “wrong” subject, people without rich parents, people who are neither studying nor working, elderly people who have to deal with small pensions, illegal immagrants, refugees, people in precarious or low-paying jobs, single parents, ill or dependent persons, punks etc. So everyone who is not young, dynamic, flexible, happy and successful will not have a place in a neoliberal “dreamworld” were everyone and everything has to have value. The basis of this is the already existing system of property ownership. Together we shall fight this all. We shall fight because it is not ok that rent increases, or exists. Because it is not ok that People who asked for asylum often are not able to get a normal flat. Because it is not ok that there are People without a Flat because it’s too expensive. Because it is not ok that tenants get bullied by owners. 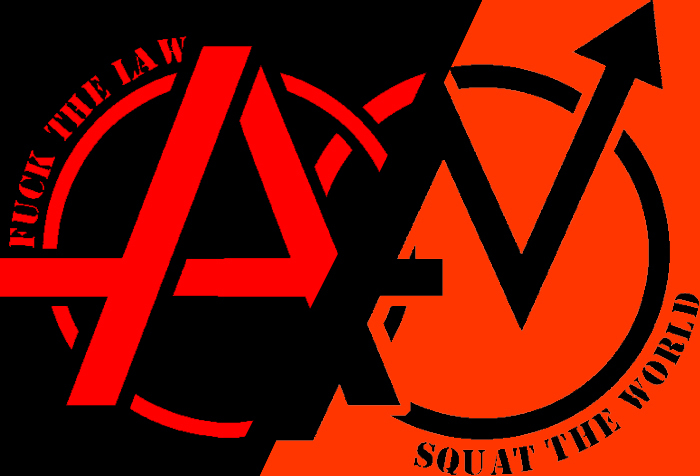 Because particularly, we want to fight for a solidaric coexistence in a free Squat as an anti-capitalistic alternative. To prevent the eviction, it will be too late if we meet on the 28.07.2014. 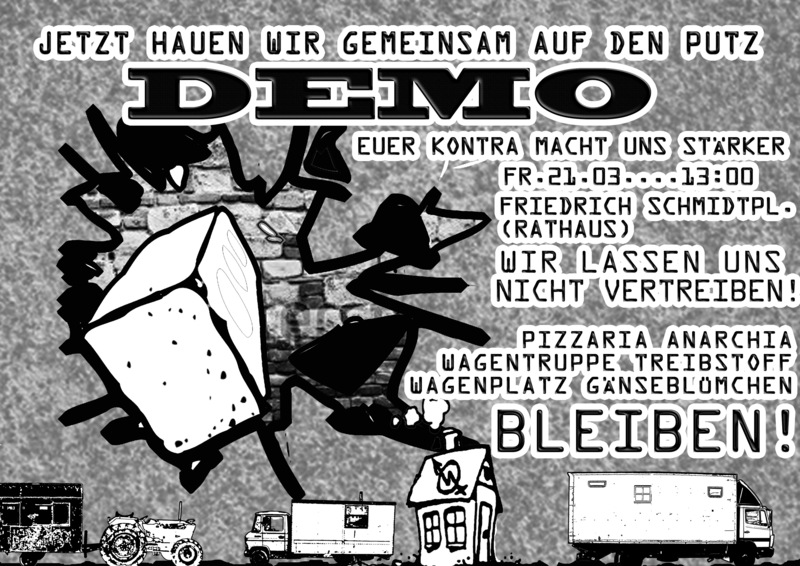 Therefore at the 20.04. we will start the “Pizzeria Anarchia – Squat the World – Action Days”. Here we want to share our knowledge, get in contact with you, have discussions, work to save the house and make Actions which are a foundation to prevent the eviction. All this will culminate on 1st May with a street-party. Check the latest news on this on the blog: pizzaction.noblogs.org. Here you find information about the program, sleeping places and more. The Eviction date is 28.07 and we ask you from now onwards to come and help us prevent it. There is a last possibility to delay the eviction through the legal system, but we don’t know if this will work, and it is still only a temporary solution. We have to prepare for every possibility. On this day it will be a fight against rent, evictions and gentrification. We will take back the power from the city. We like to greet everyone who is fighting for a self-organized lifestyle, against control and prejudice; we are in solidarity with you. Move! Be loud and have a wild and dangerous life! The furnace is far from burnt out! The World is a Pizza, and belongs to everyone! Pizzería Anarchia es una okupa en Viena. Nuestra casa. Por mas de 2 años le hemos dado nuestras esperanzas y sueños. Hemos vivido aquí juntos, compartiendo nuestras guerras y amores. Hemos tenido discusiones, talleres, cocina comunitaria, acciones y resistencias contra el insostenible statu-quo de la actual sociedad y estado. En estos 2 años hemos vivido sin contrato y seguimos en contra de tener uno. Esta condición, por supuesto, la ley austriaca no lo acepta, por lo tanto intentaran desalojarnos el 28.07.2014. No nos iremos, lucharemos por nuestra casa y preguntamos por tu apoyo. Esta no es solo nuestra lucha. Es también por nuestros vecinos quienes han vivido aquí por años con contratos indefinidos. Ellos no están afectados directamente en el desalojo, pero el dueño (Castella GMBH) les ha estado presionando para que se vayan desde hace tiempo. Cuando nosotros estemos fuera, el dueño podrá presionarlos de nuevo, porque ya no podremos continuar defendiéndoles. La empresa Castella GMBH tiene planeado reconstruir la casa y en ese plan, los apartamentos de nuestros vecinos y amigos no existen. Durante años han vivido aquí y lo han llamado su hogar, y no se quieren ir. Las tácticas que fueron utilizadas por Castella GMBH para intentar echarles incluyen: vandalismo en el sistema de suministros, daños en el tejado para que la lluvia entre en los apartamentos, negarse a realizar los trabajos de mantenimiento, visitas nocturnas para intimidar a las personas, ofertas financieras y ataques con acido butírico, aceite usado o pintura. Cuando estos intentos de intimidación fallaron, al dueño se le ocurrió la idea de invitar a un grupo de „Punks“ para que acabaran con la paciencia de los inquilinos. Desde que nos movimos a la casa, no hemos seguido el juego del dueño. Hemos apoyado la larga estancia de los residentes contra Castella GMBH. Durante el tiempo que hemos estado aquí, la Pizzería Anarchia siempre se ha desarrollado mas y mas con proyectos que resisten. Un fuerte NO! en la cara de la sociedad. Hablamos de nuestro problema y tratamos de combatirlo. Intentamos encontrar juntos los caminos para sobrevivir en esta pesadilla capitalista diaria. Finalmente hemos construido una resistencia concreta en contra de la especulación del estado y su aburguesamiento, en este barrio y en toda la ciudad. No siempre somos los vecinos fáciles, pero intercedemos en el camino en el que Castella GMBH puede atacar a nuestros vecinos mediante la publicación de sus actos, deteniendo sus sabotajes y bloqueando directamente la intimidación. Durante el tiempo que hemos vivido aquí, los trabajos de construcción planeados por Castella GMBH no se han podido realizar, debido a que no puede haber personas dentro de la edificio, nuestros vecinos deberían abandonar sus apartamentos por su cuenta, quizás por un periodo de años. Nuestra presencia aquí es un constante bloqueo del inhumano y capitalista día a día de Castella GMBH. Para nosotros son razones suficientes para hacer todo lo que este en nuestro poder para proteger esta casa y quedarnos en ella. Haciéndolo todo, incluso el uso de armas jurídicas. Pero es importante decir que no es una cooperación con el sistema legal contra el que luchamos. Lucharemos de todos los modos posibles para acabar con la represión y para resistir el desalojo de nuestra casa. El alojamiento es una necesidad básica que es tratada como una comodidad. Por lo tanto, pensamos que la decisión de luchar por un espacio donde vivimos sin pagar ningún alquiler es una critica al sistema. Alquiler, pobreza, la falta de opciones alternativas de viviendas son tratadas con represión, y el desplazamiento de las personas; estas cosas son parte del control del sistema lo que nos impide vivir el modo de vida que queremos. Este sistema es especialmente duro para la gente que es „inferior“ a ojos del sistema: gente que estudia el tema „equivocado“, gente sin familiares ricos, gente que no estudia por trabajar, las personas mayores que tiene que vivir con pequeñas pensiones, inmigrantes ilegales, refugiados, gente con trabajos precarios y bajos sueldos, madres/padres solteros, gente enferma o dependientes, punks, etc. Entonces todo aquel que no es joven, dinámico, flexible, feliz y exitoso, no tendrán espacio en un neoliberal mundo de sueños, donde todos y todo tiene que tener un valor. La base de esto es el sistema ya existen de la propiedad. Juntos lucharemos por todo esto. Lucharemos porque no esta bien el incremento de los alquileres o su existencia. Porque no esta bien que la gente que pregunta por asilo normalmente, no puedan tener una casa. Porque no esta bien que haya gente sin casas porque sean muy caras. Porque no esta bien que los inquilinos sean maltratados por los dueños. Porque, particularmente, queremos luchar por una coexistencia solidaria de libres okupas en una alternativa anticapitalista. La fecha del desalojo es el día 28 de Julio de 2014 y te preguntamos si de ahora en adelante vendrás para ayudarnos a prevenirlo. Nos gustaría saludar a todxs los que estáis luchando por un modo de vida organizado por ti mismo en contra del control y los prejuicios. Estamos en solidaridad contigo!! El mundo es una Pizza y nos pertenece a todxs!! Inzwischen zum 3. mal machen wir und viele die sich dran beteiligen an diesem 1. Mai ein Straßenfest vor unserem Haus in der Mühlfeldgasse / Holzhausergasse. Los geht’s ab 14 Uhr, ab 12 freuen wir uns wenn Leute vorbei schauen und beim Aufbauen, Kochen etc. helfen. Gestern, Freitag den 25. April, streiften zwei Kiwara gegen 20 Uhr durch die Mühlfeldgasse im Zweiten Wiener Gemeindebezirk. Kurz darauf wurden Menschen vor der Pizzeria Anarchia Opfer eines Angriffs der Bullen. Wie so oft führten die unser Grätzl terrorisierenden Wiener Cops eine rassistische Kontrolle durch. Einige Menschen in der Pizza, die gerade an einem öffentlichen Workshop teilnahmen, entschlossen sich eine solidarische Intervention zu starten. Diese beschränkte sich auf Fragen nach dem Grund der Kontrolle (eine normale Kontrolle), Fordern der Dienstnummer (30967) und der Dokumentation via Fotos. Die kontrollierte Person wurde von der Polizei mitgenommen. Es wurde versucht durchzusetzen eine solidarische Person im Bullen-Auto mitfahren zu lassen bzw. den Namen des Postens zu erfahren, zu welchem die Person gebracht werden sollte. Continue reading Wiener Bullen drehen durch! 3 Menschen brutalst festgenommen! 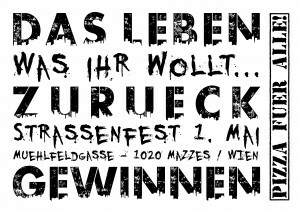 Grätzl belagert! Comment on Wiener Bullen drehen durch! 3 Menschen brutalst festgenommen! Grätzl belagert! Comment on Vorbereitungstreffen 1. 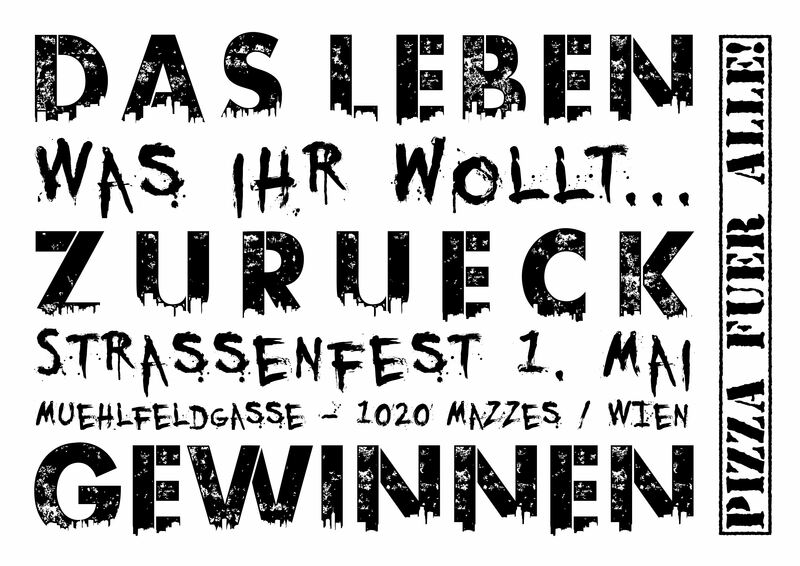 Mai-Straßenfest "Was ihr wollt..."
Our ActionDays-Blog with detailed information and program is now online! Pizzaria Anarchia is a squat in Vienna and has been squatted for over two years. During this time we were able to try out many ideas and projects, and to find possibilities to live alternative ways apart of the capitalist system. Lots of people enjoyed Pizza (VoKü), took part in discussions, readings, info-events or concerts and movies in the weekly cinema. Workshops like Book-binding, bike-kitchen and language exchanges took place. Also the pizza-collective tries to help other projects and houses whenever possible. Last but not least the Pizzeria is a room for political action and social meeting place for many, partly away from the capitalist world. We live here, we have come to know friends, companer@s and aliens; now they want to take this place from us. We will do everything to avoid the eviction of this house- but we need your support! 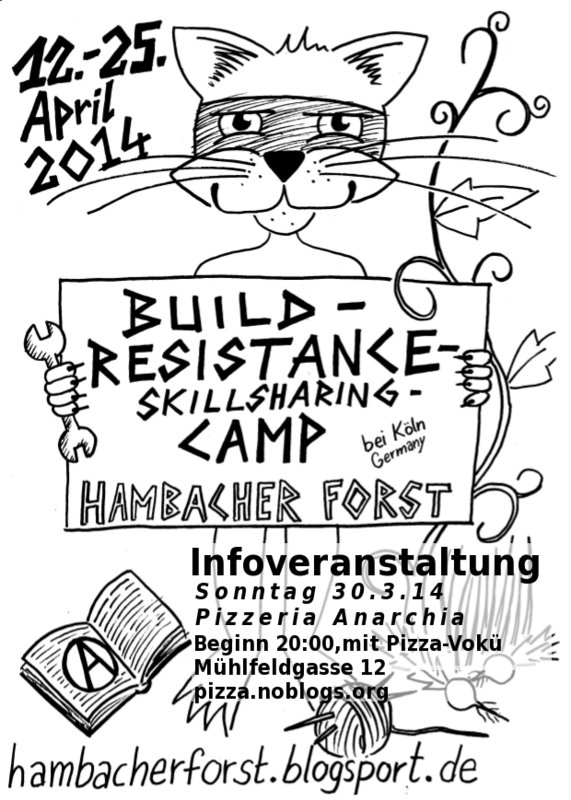 join our „Pizza bleibt- Squat the World„ ActionDays from 20th April to st of May 2014! There will be a colourful programm with theoretical, practical and creative workshops, building, direct actions, info events, dicussions, concerts, parties and more! We invite you to our action and to defend the house together. Bit also to meet, exchange our experiences and to network. The realisation of all these ideas dependes on your participation and participartion of everyone. If you have something to add or if you have any proposals for the program just contact us or join us at our place. We are looking forward to you contibution! Solidarity is our weapon! Pizzeria Anarchia stays! Continue reading Short Film Night 8.4. Comment on Short Film Night 8.4. Bring bitte wenn möglich Zelt, Schlafsack, Isomatte, Regen- und Windfeste Kleidung mit, da wir nur über eine begrenzte Anzahl an Schlafmöglichkeiten verfügen. Außerdem wäre ein Zuschuss zum Essen auch sehr hilfreich (vorher vielleicht nochmal groß containern oder so), allerdings kein Muss. Freiräume sind bedroht! Die Pizzeria Anarchia steht kurz vor der Räumung, die Wagentruppe Treibstoff und der Wagenplatz Gänseblümchen sind bedroht. Deshalb rufen wir zu einer gemeinsamen Demo für den Erhalt von selbverwalteten Räumen und Plätzen auf.